Continue on to read the official press release with details of the official Madden NFL 19 Super Bowl LIII simulation. 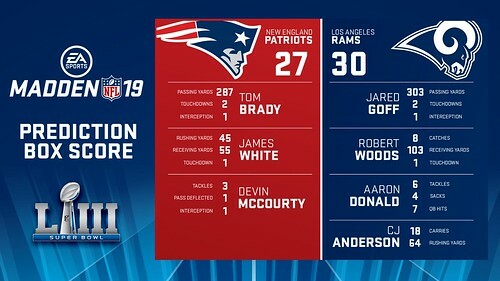 Today, Electronic Arts Inc. (NASDAQ: EA) released the official EA SPORTS Madden NFL 19 Super Bowl LIII simulation, predicting a big win for the Los Angeles Rams as they walk away Super Bowl Champions and defeat the New England Patriots 30–27. Aaron Donald received the MVP award following a record-breaking Super Bowl performance in which he tallied four sacks. Let's hope but I wouldn't put money down voting against the Pats.